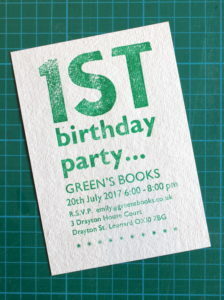 On 20th July we celebrated our first year in business with a small gathering of friends, family, colleagues, and customers. A lovely evening was had by all and we thoroughly enjoyed the opportunity to say a big thank you to everyone for their support so far. Arthur wins Institute of Conservation award! 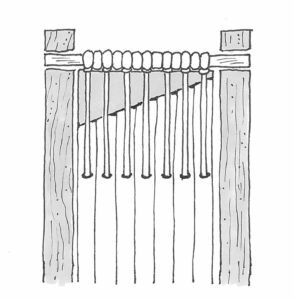 Sponsored by publisher Taylor & Francis, the 2016 ICON Journal Award was recently awarded to Arthur for his latest paper ‘A Compensation Endband: A Structural Endband for a Book with Uneven Edges’, which describes the endband developed specifically for use on a late-medieval parchment manuscript at the Bodleian Library (MS. Laud Misc. 99). The award was announced on the ICON website from where the article may also be accessed. We are pleased that the studio has been busy with some interesting conservation projects throughout our first year; however, we’ve also been run a variety of workshops. 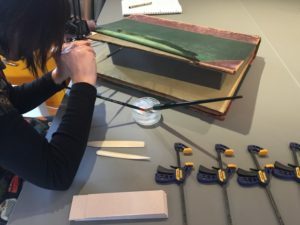 The highlights including a five-day course on springback bindings and a one-day workshop for professional and student conservators on repairing parchment. 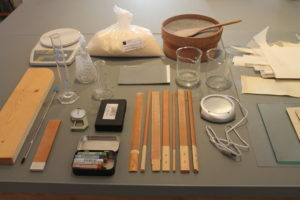 In addition to workshops, Arthur has also enjoyed open studio sessions and one-to-one teaching. Particularly interesting was the opportunity to work with Dr Victoria Purewal, a freelance natural science conservator, about the practicalities of conserving bound herbaria. Following her visit, Victoria wrote a review of her time at the studio for ICON News. 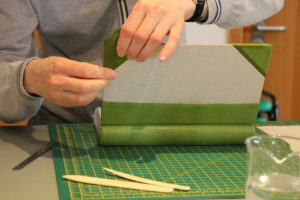 We have lots of new workshops and events in the calendar (http://www.greensbooks.co.uk/bookbinding-workshops-and-courses/), including the springback binding and parchment repair courses which are both back by popular demand. 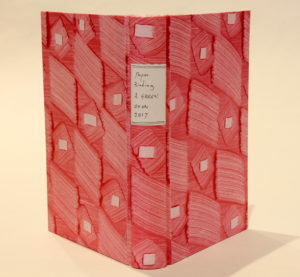 We’re also looking forward to our new three-day course on lapped paper case-bindings where students will design and make their very own paste-paper for the binding! Emily and Arthur Green, 17th August 2017.